Sunday night in Monterey, I saw a good band, an almost-great band, a could-have-been-great band, that fell short because of what it was missing. Part of what’s missing is tangible and part of it is intangible. The tangible part, is a person. The band that’s still running around calling itself Yes came to town the other night, and while I bought tickets with very mixed feelings, I couldn’t say no to hearing songs I’ve always loved played this close to where I live by a band that founding bass player/harmony vocalist Chris Squire, longtime guitarist Steve Howe, and longtime drummer Alan White continue to anchor, joined by keyboardist Geoff Downes (briefly a member in 80-81) and new vocalist Jon Davison (of prog-rockers Glass Hammer, and formerly of a Yes tribute band). The experience was a weird mix of joy and sadness. Joy at hearing music that I still love, played often, if not always, at a very high level. But ultimately it was a disjointed, numbing experience, because without co-founder, lyricist and lead voice Jon Anderson (and to a lesser extent, longtime keyboard maestro Rick Wakeman), what you’re left with is a really good Yes tribute band. I want to be very clear here. Jon Davison and Geoff Downes made the same decisions most people would make in their shoes, and as far as I am concerned, they are blameless in this scenario. They are out there making a living playing music that they obviously respect and cherish. They are professionals who give their best every night in difficult circumstances. It’s not their fault that the band they’re in isn’t the real Yes; it’s just that it can’t be. For as long as Jon Anderson is out of the band (and I’ve discussed why that is the case at some length elsewhere), you’re going to have a man singing Jon Anderson’s words, most of the time to music composed or co-composed by Jon Anderson, in a voice that’s very much like Jon Anderson’s, but without Anderson himself being present. That fundamentally changes the experience of watching this band. The experience is of watching an avowed fan of the band (which Davison is) fulfill a dream. In that respect, I feel good for Davison. He loves this music and he’s a good singer. It’s not his fault he isn’t Jon Anderson and I don’t blame him for taking the job. Squire and Howe and White wanted a singer who could sing Yes songs, and if that’s your need, he’s a damned good choice. But part of the experience of sitting in a theatre and watching this music being played is watching the people who created the music play it, i.e. watching Anderson sing the words that he wrote and the melodies that he composed. Anderson is no saint; he and Squire and Howe all share responsibility for things coming to this, but there’s no getting around the fact that most of the music that was played at the show I saw the other night was composed, either in part or in whole, by Jon Anderson. And he wasn’t on the stage, and he could have been, if the former bandmates who kicked him out of the band he co-founded when he was too ill too perform were willing to compromise and tour less intensively. This is sad because it’s wrong, but also because Yes music is amazing. If I closed my eyes and pretended I wasn’t seeing what I was seeing for moments during songs like “Siberian Khatru” or “Yours Is No Disgrace” or “Perpetual Change” or “Parallels” or “Awaken,” I could get lost in the music again. Steve Howe is still at the top of his game; the guy is amazing, one of the best guitarists in the world. Some fans claim Squire and White have lost a step, and I noticed a couple of spots where Squire would skip over complicated bits and vamp instead, but for the most part, the rhythm section felt on the money. My hat’s off to Geoff Downes as well, who is doing this tour under the most difficult of personal circumstances, I have great compassion for the guy and respect for the fact that he’s out there giving it 100 percent every night. But as I said to my buddy between songs, you have to feel for any keyboard player who gets up in the morning and says to himself “I’ve gotta play Rick Wakeman’s parts live tonight.” It’s not Downes’ fault that he’s not in Wakeman’s class as a keyboard player; only a handful of people on the planet are. And the mix didn’t help him; there were several spots where he was mixed so low you had to strain to hear him at all, especially during The Yes Album segment. With the news Monday night that founding Yes guitarist Peter Banks has died, the stakes for the future couldn’t be clearer. 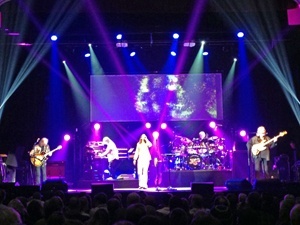 The band members from the classic lineup of Anderson, Howe, Squire, Wakeman and White are all in their sixties. The clock is running out, and the question before Squire and Howe is simple; which is going to be your priority from here on out, the money or the legacy? To choose the latter, Yes will need to welcome Anderson (and hopefully also Wakeman) back and be willing to tour less often and less intensively. Choosing this path can burnish Yes’s once-secure status as one of the cornerstones of the progressive rock genre. Otherwise, the group is simply playing out the string, more a business than a band. 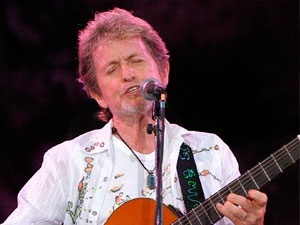 Returning to my opening thought, the tangible part that was missing Sunday was Jon Anderson. The intangible part was the heart and soul of this band. And whether Squire and Howe like it or not, the tangible and intangible parts that are missing are one and the same. So which is it going to be, gentlemen, the money or the legacy? It’s decision time.